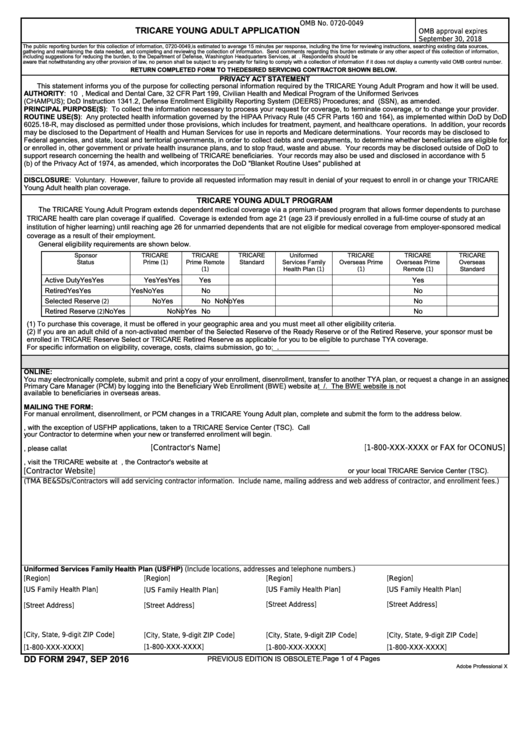 Download a blank fillable Dd Form 2947 - Tricare Young Adult Application in PDF format just by clicking the "DOWNLOAD PDF" button. Complete Dd Form 2947 - Tricare Young Adult Application with your personal data - all interactive fields are highlighted in places where you should type, access drop-down lists or select multiple-choice options. aware that notwithstanding any other provision of law, no person shall be subject to any penalty for failing to comply with a collection of information if it does not display a currently valid OMB control number. RETURN COMPLETED FORM TO THE DESIRED SERVICING CONTRACTOR SHOWN BELOW. This statement informs you of the purpose for collecting personal information required by the TRICARE Young Adult Program and how it will be used. (CHAMPUS); DoD Instruction 1341.2, Defense Enrollment Eligibility Reporting System (DEERS) Procedures; and E.O. 9397 (SSN), as amended. PRINCIPAL PURPOSE(S): To collect the information necessary to process your request for coverage, to terminate coverage, or to change your provider. Young Adult health plan coverage. coverage as a result of their employment. General eligibility requirements are shown below. (1) To purchase this coverage, it must be offered in your geographic area and you must meet all other eligibility criteria. enrolled in TRICARE Reserve Select or TRICARE Retired Reserve as applicable for you to be eligible to purchase TYA coverage. available to beneficiaries in overseas areas. For manual enrollment, disenrollment, or PCM changes in a TRICARE Young Adult plan, complete and submit the form to the address below. your Contractor to determine when your new or transferred enrollment will begin. or your local TRICARE Service Center (TSC).